The colour is amber and the texture shows early medium legs and late fat tears. The nose is of a typical old grain profile that you either like or not. 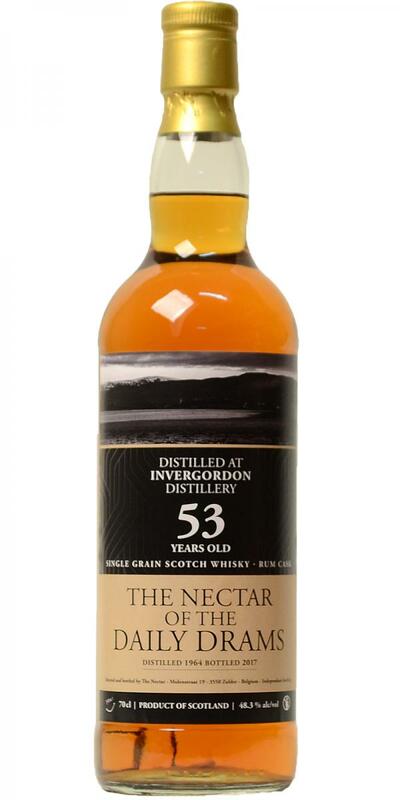 It is very complex on heavy woods (53 years in cask), spices, floral and fruity aromas. The rum notes are rather shy but after a while they show up and offer additional vanilla aromas that grow stronger minute by minute and nicely contain the wooden notes. Not too bad for my tastes. It arrives a little hot (peppery) in the mouth but is nicely coating. Interestingly, the tannins are not that strong as I expected from the nose (what is good). The taste is typically grainy, too with more dominant rum flavours (vanilla, demara sugars). It is not as complex as the nose but still very fine. The finish is long and even more rum-ish with bolder wooden flavours (tannins) that are not adstringent at all. Water is not needed. A decent old grain that stood the test of time with dignity. Grain lovers will adore it, for sure. But it is worth a try for all others, too. I have tried my fair share of old grain – including Invergordon, the grain distillery owned by Whyte & Mackay and only founded in 1959. So this is a distillate from the first lustrum, that slept on a rum cask for more than half a century. This is the oldest Invergordon I have tried so far, both in terms of years of distillation as in years of maturation. It was bottled by The Nectar from Belgium. I discovered it at their Spirits in the Sky festival last year but only now found the time to sit down and give it a try. The honeysweet nose is a wonderful mix of corn on the barbecue, wood glue, popcorn, dark fruit, green banana, white chocolate with crispy rice (Galak Popri), coconut milk, vanilla and… rum! Yep, this reminds me a bit of Malibu, so the rum cask really put down its foot and made this grain quite interesting and delicious. It is oily, just shy of creamy, and piquant and honeysweet from the get-go. Piquant because of the great spiciness (nutmeg, all kinds of peppers and some vanilla) and honeysweet on notes of dark fruit and… can you guess it? Loads of sugars. I repeat: this must have been quite an active rum cask indeed. It’s almost as if I can taste the demerara sugar. That makes this grain less astringent than might be expected. The chemical sweetness is totally absent. This is very, very good! The finish is surprisingly long and retains those lovely rum notes. Serve this blind and people will call it a magnificent rum. But it’s a grand grain, that much is certain. Around 360 EUR which is not cheap, but you do get something in return. How many grain whiskies do you know that score this high?